When Finland was born, the Finns were quite literally a young nation. In 1917, 35 per cent of Finns were under 15 years of age, and half of the population was under 25. When Finland became independent, it was a rural country whose urbanisation had been accelerating since the end of the 19th century. Apart from Norway, Finland was the most Lutheran country in Europe, with more than 98 per cent of Finns belonging to the Church. In 1917, Finland had a population of 3.1 million. According to the population census of 1910, 88.1 per cent of the population spoke Finnish, 11.6 per cent Swedish, 0.25 per cent Russian, 0.06 per cent German and 0.07 per cent other languages as their mother tongue. The population of Finland had tripled over the years under Russian rule, 1809–1917. The population grew due to high birth rates, even though the final years of autonomy were a time of high emigration. Between 1870 and 1914 some 300,000 Finns moved to the United States. About a quarter of them returned to their native land. Between 1860 and 1910, the population of Finland grew by 68.5 per cent. The number of children born was particularly high in 1898–1917, when an average of 88,450 children were born annually. However, the total fertility rate indicating the number of children born to a woman began to decline in the early 20th century and was 3.7 when Finland became independent. In 1917, 81,046 children were born in Finland. Of them, nearly 12 per cent died during their first year of infancy. Statistically in 1917, a newborn boy was facing 43 and a newborn girl 49 years of life. Child mortality remained high until five years of age. The life expectancy for boys born in 1917, who survived to their fifth birthday, was 57 years and for girls, 60 years. Of the boys, nearly 5,400 died prematurely in the Second World War. In 1910, 84.2 per cent of Finns lived in rural areas and 15.8 per cent in cities. Urbanisation accelerated in the final years of Russian rule. The primary destination of internal migration was Helsinki, whose population doubled between 1900 and 1917. Migration affected the language situation in the capital, as the number of Finnish-speaking inhabitants exceeded the number of Swedish-speaking inhabitants in 1900. When Finland became independent, the population of the capital was 187,000. Among the ten largest cities were also Turku (56,200), Tampere (46,400), Vyborg (29,700), Vaasa (24,800), Oulu (21,940), Kuopio (18,106), Pori (17,608), Kotka (11,794) and Lahti (6,588). Before 1917, around 17,000 Finns lived in the capital of the Empire, St. Petersburg. The number of Finns living in St. Petersburg had peaked in the 1880s, when some 24,000 Finns lived there. The agrarian population consisted of landowners, renters of whole farms, renters of parts of farms and tenants living on small landholdings (crofts). In addition, especially in Eastern Finland, there were itinerant people who lived in other people’s homes. In 1912, there were 151,500 rented farms in Finland. Of these, 1,500 were rented whole farms, 55,000 were rented parts of farms and 95,000 were tenanted crofts. The number of independent farms was 110,000. One third of Finns earned their living mainly from paid farm work. In 1917, almost all Finns could read. 51.8 per cent of the population could both read and write. 42.8 per cent could only read and 21,560 people (0.9 per cent) could not read at all. In 1917, less than two per cent of the age group passed the matriculation examination which opened doors to university studies. Of them, 60 per cent were boys. Overall, the people’s educational level was low. 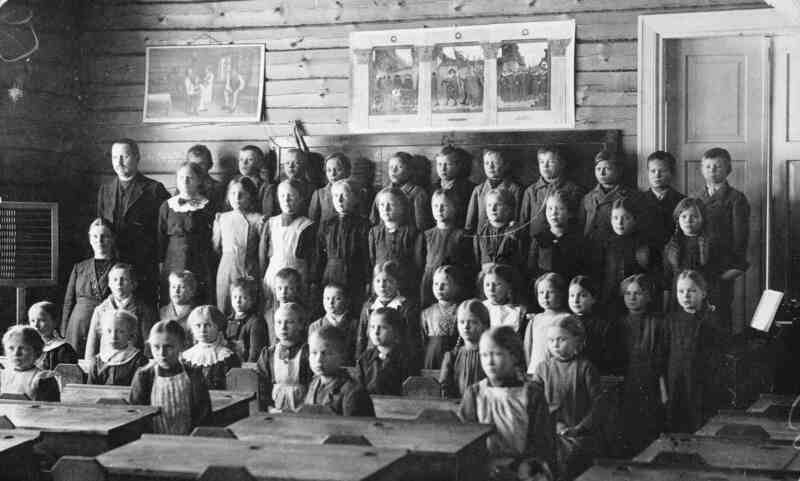 Only 4.5 per cent of Finns had received education after primary school. In terms of religion, Finland was a very homogeneous country in 1917. As much as 98.1 per cent of Finns belonged to the Evangelical Lutheran church, 1.7 per cent were Orthodox, and 0.2 per cent members of other Christian faiths. There were also Jews and Islamic Tatars who, because of their religion, did not have full civil rights. The Jews were granted full civil rights by a Senate decision of 22 December 1917, which entered into force on 12 January 1918. At that time, there were about 1,000 Jews living in Finland. The Finnish Islamic Congregation was established in 1925 under the Freedom of Religion Act, which entered into force in 1923. When Finland became independent in 1917, it was an agrarian country. Agriculture and forestry provided livelihood for 66.3 per cent of the population, while 12.2 per cent worked in the industrial sector. Traffic and transportation provided livelihood for 2.8 per cent and trade for 2.2 per cent of the Finnish households. Six per cent did occasional work, and 1.3 per cent were officials, policemen or priests. Teaching provided livelihood for 0.7 per cent and health care for 0.4 per cent of Finns. In addition, 7.9 per cent belonged to diverse other groups. The gross domestic product in the Grand Duchy of Finland grew relatively slowly up to the end of the 1880s, just over two per cent a year. Because of the population growth, the per capita growth was only slightly more than one per cent. After that, the growth rate slightly increased and was three per cent per annum and a little less than two per cent per capita. During the First World War, Finland’s GDP decreased by a third. The collapse was followed by years of rapid increase from 1919 to 1928. During the recession in the early 1930s, GDP decreased, but the economic depression was less severe than in Western Europe and the United States. At the beginning of the 20th century, Finland’s GDP per capita was about 75 per cent of that of Sweden. In independent Finland, GDP per capita was only a half of that of Sweden. In the inter-war years, the rate of economic growth was about the same in Finland and Sweden. In the late 1930s, Finland’s GDP was about two thirds of that of Sweden. The economies of both countries grew faster than the average in Western Europe, making Sweden one of the most prosperous countries in Western Europe. In Finland, GDP climbed to 80 per cent of the average in the region. During the First World War, Finland’s economy was affected by inflation, which was a new phenomenon in Finland and even globally. People had grown accustomed to stable prices and many had started saving money. Prices in Finland grew tenfold in four years and the value of money declined. Finnish Markka lost 90 per cent of its value during the First World War. People’s savings deteriorated and the real value of loans collapsed. In 1918, the inflation rate was 238 per cent, which is by far the highest in Finland’s history. However, the country escaped the hyperinflation which brought about the collapse of the Central European economies in the early 1920s. The World War with its repercussions profoundly changed Finnish foreign trade. It was a special feature of the Grand Duchy of Finland that it had a customs border with Russia. Before the First World War, Russia was no longer Finland’s most important trading partner. The main export countries in 1910 were Great Britain (29.5%), Russia (27.4%), Germany (12%) and France (8.5%). Exports largely consisted of products of the forest industries (73.5%). The main import countries were Germany (41.6%), Russia (28.7%), Great Britain (11.9%), Denmark (5.4%) and Sweden (5.1%). Great Britain had replaced Russia as the most important export country at the beginning of the 20th century. At the same time, Germany surpassed Russia as the most important importer. Cereals, in particular, were imported from Germany in large quantities. Normal trading came to a halt as the World War broke out. During the war years, Russia became Finland’s primary trading partner. The Russian war economy stirred up demand and brought money to Finland, which accelerated inflation as supply declined. On the other hand, Russia became the only supplier of food grains to Finland. The Bolshevik revolution in October 1917 had a significant impact on Russia’s role in Finland’s foreign trade. From the 1860s on, the road and railway networks improved in Finland. In 1917, there were 4,137 kilometres of railways in the country. The main railway tracks to Oulu via Tampere and Ostrobothnia (1862–1884), to Turku (1903), to St. Petersburg via Vyborg (1870) and to Kajaani via Savo (1889–1904) had been built. From Oulu, the track had been extended to Rovaniemi in 1909. The connection to Joensuu was via Vyborg. Boats operating in inland waterways transported people and freight in large quantities on the waters of Päijänne and Saimaa. Local boat traffic was lively on the Baltic coast as well. In 1917, Finland had 22,000 kilometres of roads. Roads were not ploughed in winter due to low traffic. There were a little over a thousand cars in the country in 1917. Land transport relied on horses, of which there were 400,000. The number of bicycles increased rapidly in the early 20th century when their prices fell due to industrial manufacturing. It is estimated that at the beginning of the 1920s, there were 200,000 bicycles in the country. Mass media in Finland in 1917 was based on newspapers and magazines, which appeared abundantly in both Finnish and Swedish. The largest newspapers were Työmies, Hufvudstadsbladet, Helsingin Sanomat and Uusi Suometar, which were all published in Helsinki. Työmies, which supported social democratic ideas, was the largest newspaper in the country. Its circulation grew especially during 1917. All other newspapers, too, increased their subscriber numbers during the First World War. Finnish people were interested in war news. In the periodical press, satirical magazines that commented on topical phenomena had a solid position. All newspapers and magazines were affected by the fact that censorship disappeared almost completely after the March revolution. After the revolution, there was unprecedented freedom of expression. Finland 1911: Finland 1911 is a Finnish film on tourism, filmed in 1909–1911. The camera tours Finland from Turku to Porvoo via Naantali, Hanko and Helsinki. The film continues with the oldest preserved film clips of Tampere, which show a full minute of shots of the city centre and Pyynikki. The journey continues via Vyborg, Imatra, Olavinlinna, Valamo, Koli, Oulu and Kajaani to Tornio basking in the midnight sun. Railways were the most efficient and fastest mode of transport in Finland in 1917. The rail network had been built to serve both Finland’s own needs and the military needs of the Russian Empire. The track gauge was and still is the same in Russia and Finland. The main track between St. Petersburg and Helsinki, completed in 1870, was built some distance off the coast of the Gulf of Finland for military reasons. Russia’s military needs also affected the routes chosen for inland tracks. Thanks to the extensive network of canals and locks, passenger and freight boats could reach even the farthest corners of the Saimaa and Päijänne lake systems in the 1910s. Boats sailed on other major lakes as well, except for Lake Inari. The boats transported people and goods along the waterways. Water transport facilitated access to railways and boosted transportation during the summer. Before the waterway connections, many goods had to be transported in the winter by horse. The waterways were also important timber floating routes. Tugboats pulled large rafts of raw timber for processing in pulp and paper mills and sawmills. The expansion of water transportation increased the demand for metal-built inland waterway vessels, which had to be able to navigate in shallow fairways and dock at lightweight piers. Moreover, the vessels had to be suitable for both passenger and freight transport. Steam-powered vessels were built in Tampere, Turku, Varkaus and Vyborg, among other places. The Turku-based Crichton shipyard received large orders from Russia already in the 1860s. Also the Hietalahti shipyard in Helsinki delivered ships to Russia and other Baltic coastal states. By 1889, Paul Wahl & Co’s engineering workshop in Varkaus built 152 steamboats of different sizes. The company was bought in 1909 by A. Ahlström Oy, which continued the shipbuilding business. By 1937, the company had built 598 vessels. Ship-building continued during the war reparation years, with the Varkaus shipyard making river and lake tugs. The rapid growth of road traffic made water transportation largely unprofitable from the mid-1920s on. Improved road conditions accelerated the growth of road transport in regard of both passenger and cargo traffic. However, in the transport of raw timber (logs), the waterways maintained their position until the 1950s and 1960s. In the inter-war period, freight was still transported on the decks of passenger ships, which was hazardous and even caused accidents. At least two major accidents were caused by incorrect loading. In September 1929, 136 people lost their lives when the steamboat Kuru sank. In 1934, thirty-four passengers drowned when S/S Louhi capsized and sank in Leppävirta.